Spanning more than 366m, the Garden Bridge will link the Temple underground station on the north bank to the south bank. Image courtesy of Arup. The Garden Bridge project will involve the construction of a pedestrian crossing and public garden. Image courtesy of Arup. The bridge will link the artistic locations of south bank with the famous West End theatres of the north bank. Image courtesy of Arup. Winding walkways through the garden that will be open from 6am up till midnight are designed for use by the pedestrians. Image courtesy of Arup. The 'floating' garden will feature native plants, trees and shrubs from northern Europe and other parts of the globe. Image courtesy of Arup. The bridge widens and narrows along its length, adding more spots on the way that offer unparalleled views of the city. Image courtesy of Arup. The garden will consist of uninterrupted spaces that will display a landscape echoing the unique attributes of the city, as well as the south and north banks. Image courtesy of Arup. 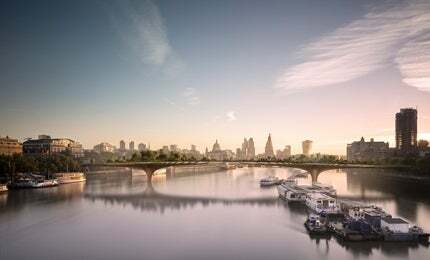 The proposed Garden Bridge on River Thames, London, UK, will involve the construction of a pedestrian crossing and public garden designed by Heatherwick Studio. The bridge, designed as a floating garden over the iconic river, will introduce a modern gathering place for people, enveloped by lush green plants, trees and woodland combined with walkways. It will also link the artistic locations of South Bank with the famous West End theatres of the north bank. Idea for the Garden Bridge originated when a tender was floated by Transport for London (TfL) seeking proposals for revamping pedestrian passes across the river. A plan to connect north and south London via a garden was developed by Heatherwick Studio, and actor and campaigner Joanna Lumley. The design architect, in collaboration with engineering consultants Arup, is working with TfL on the Garden Bridge. A charity named The Garden Bridge Trust was set up in 2013 with Lord Mervyn Davies as its Chairman to aid in the bridge construction. The project received approval from the mayor of London in 2014. Construction on the project is expected to begin in 2016, and opening is scheduled for 2018. The Garden Bridge will be free to use and accessible for all throughout the year. An estimated 10,000 people are expected to use the bridge for commuting to work on weekdays. It will also reduce the travel time between Temple underground station and the south bank. "An estimated 10,000 people are expected to use the bridge for commuting to work on weekdays." Connecting the vibrant South Bank to the north bank, the bridge will nourish and aid in the growth of businesses on both the ends, while providing new routes for the travellers. By setting up a ‘green corridor’, the bridge will benefit the existing wildlife and pollinators and promote the diverse ecologies of all the connecting areas. Spanning more than 366m, the Garden Bridge will be located between Blackfriars and Waterloo bridges, and will link the Temple underground station on the north bank to the south bank. The bridge structure widens and narrows along its length, adding more spots on the way that offer unparalleled views of the city. It will feature a 2,500m² garden that will be lined with 270 trees, 2,000 shrubs, hedging plants and climbers, more than 22,000 hardy perennials, ferns and grasses, and 64,000 bulbs. Winding walkways through the garden that will be open from 6am up till midnight are designed for use by the pedestrians. The landing points on either side of the bridge, especially the roof of the south bank landing, have been designed to hold long queues. A protective casing will be built using 240t of copper-nickel alloy to protect the structure from the Thames river bed to the base of the balustrades on the deck. Apart from imparting a warm colour to the bridge that contrasts with its stone and steel structure, the coating will also provide protection from corrosion. The ‘floating’ garden will feature native plants, trees and shrubs from northern Europe and other parts of the globe, thus aiding in environment preservation. The garden will consist of a number of uninterrupted spaces that will display a landscape echoing the unique attributes of the city as well as the south and north banks. The visitors will be able to enjoy the changing seasonal landscape on exhibit. Featuring the south bank’s marshlands, the landscape at the south end will consist of willow, birch, alder, geranium, violet and primrose plants, which will lend a serene and calm atmosphere. On display at the north end will be Temple garden’s ornamental gardening that will include wisteria, magnolia, roses, alliums, irises and summer snowflakes. Designed to be accessible by all, the bridge, the landings, internal gardens, balconies and staff facilities will feature step-free access points. Public toilets will be available in the South Landing Building on the Lambeth side. The construction of the bridge is estimated to cost £175m ($272.8m). More than 65% of the estimated cost will be financed through the private sector, while the UK Government and TfL have funded £60m ($93.5m). Dan Pearson is the landscaping designer for the Garden Bridge project. Willerby Landscapes, based in Kent, have been selected as the landscaping contractor for the initial five years of the project. A joint venture of Bouygues Travaux Publics and Cimolai has been chosen as the constructioncontractor.